The Wetlands International / IUCN SSC Swan Specialist Group (SSG) , chaired by Dr Eileen Rees of WWT, forms a global network of specialists working to facilitate effective communication between members and others with an interest in swan species. The SSG is pleased to announce the publication of its latest newsletter Swan News, which can be downloaded from the Wetlands International website. 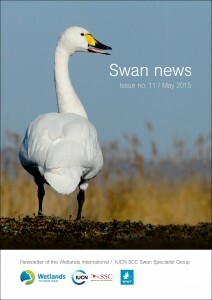 This edition brings together all the latest news from the swan conservation world, with updates on swan conservation research, including reports on tracking studies, management and recent swan literature. Updates on the development and implementation of the AEWA Bewick’s Swan Action Plan. News on previous International Swan Censuses in northwest Europe. Tracking Bewick’s and Whooper swan migration in relation to wind farms. News from recent 5th International Swan Symposium. We hope you find this an interesting read!